I hope you had a great week and really enjoyed each day! Living in the moment and being thankful for each day instead of wishing it could be the weekend. That said .. it's here :) I hope you take a break from the stressors of work/life and get in some good quality time with those you love! I'll be doing the usual...being lazy with my husband! We've gotta start being a little more productive around the house on the weekends. So maybe we will knock out a project or two .. maybe not .. ha! It's hard to do too much right now though because we have put any "house spending" on hold until our home in Nashville sells! I say be lazy .. but I have gym sessions on the weekend too! The grind never stops! Today is an endurance based lower body lift. So it takes tons of energy! 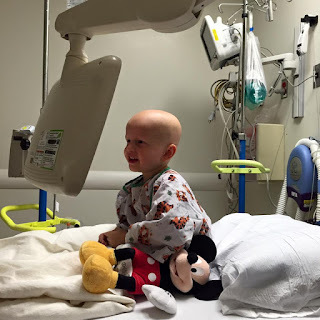 With every rep I will be lifting up and for a little 3 year old that should be outside enjoying the sunshine and playing ... but instead he is inside of a hospital recovering from surgery after having a cancerous tumor removed. He has a LONG road ahead of him. Let's send him all kinds of love. Luke is doing great recovering from his Neuroblastoma tumor removal surgery! He came out of surgery around 8pm last night and was moved from Memorial Sloan Kettering Hospital across the street to the New York Presbyterian Hospital because the Pediatric Intensive Care Unit in Sloan was full. When we got up to the PICU floor Luke got settled in and was kept sedated for a few hours. He had come out of surgery with a few tubes and wires all over him, he had a breathing tube in, a stiff NG nose tube to suction bile out of his stomach, a chest tube to drain fluid from his abdomen and chest and a drainage tube to drain excess fluid and blood where the tumor was removed from. He also had wires and monitors all over his body and bed. It was scary at first seeing all those tubes and wires connected to him. He was swollen and puffy and looked so small and fragile in the bed. As his mom my heart immediately started to hurt knowing that my precious little boy had gone through so much during surgery, that hands had been inside him and that he was most likely going to have a lot of pain over the next few days. We did get to see his tumor removal incision which stretches from the middle of his stomach all the way across to the middle of his back but looks really really good. Around 3 a.m this morning the PICU Drs. decided that he was awake enough to remove the breathing tube since he kept trying to pull it out and was biting on it out of pain and upsetness, so they sat him up and took it out for him. He wasn't crying or talking but he had tears running down his cheeks and was making soft whimpering noises so we could tell he was in some pain. They started morphine along with some other pain medications and that has helped a lot. He slept most of early this morning but is now staying awake for much longer. His surgeon came by and said he looks amazing and that the swelling is going down and that he can have the nose tube taken out and be transferred to a normal room back at Sloan once one opens up and that he doesn't think he is critical anymore. To have major abdominal surgery one day then be well enough to be moved to a normal room the next is huge and means that he is healing and doing great! So they pulled the nose tube out which made him extremely happy and he is now awake and watching cartoons with his Mickey Mouse doll. Dr. Kushner, his oncologist here in New York wants to start his 5th round of chemotherapy as soon as possible so we will likely start Monday morning. Once he has fully recovered from both surgery and this round of chemotherapy we will do an MIBG scan and bone marrow draws to see if he has any cancer left in his body. Removing the tumor was a huge mountain that we are so so thankful to be over and even though he still has another round of chemo to complete here in NY and radiation and antibody therapy to complete in Texas we know that we are on the road to eventually hearing that the cancer is gone for good. We are so so thankful for all the prayers everyone has been lifting up for our son. We thank God that He is such a good, good God and that He has been raining down His love and mercy on us. Through Luke's entire cancer journey we have wanted to make sure that we are keeping Christ at the center of it. We are called to glorify Him in every circumstance, not just the good times but also the tough times. These last few months have been the toughest of our lives. Watching Luke fight a cancer that is trying to take over his body and kill him, being separated from our daughters, having to take an extended time off work for Clint, having to give up homeschooling our oldest daughter right now for me, all of this has been hard. But the greatest thing we can do in all those hard times is to glorify Him, praise Him, worship Him, thank Him and trust in Him. We daily choose FAITH over fear and put all our hope and trust in the one who made us. We are on our knees still today, thanking Him for guiding Dr. LaQuaglia in surgery, thanking Him for Luke recovering so well so far, thanking Him for all He has done for us. We thank God for His great love for us and for how He has answered every single one of our prayers. We will keep updating on Luke and his fight against Neuroblastoma and we will keep giving God the glory and our complete trust in this journey. Truly my soul finds rest in God; my salvation comes from Him. Truly He is my rock and my salvation; He is my fortress. I will never be shaken. Obviously little Luke has a really long road to recovery. 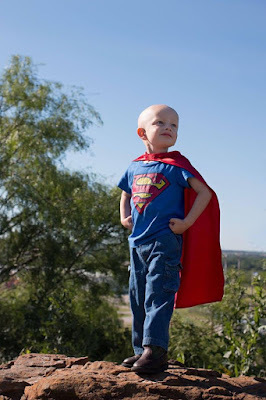 Today lets lift up and for this sweet little guy. Let's be grateful for our ability to be active, our ability to get outside and enjoy the fresh air, to go about life today without THIS kind of worry and stress. Hopefully he and his family will feel the extra love! A Go Fund Me Page has also been set up for the family if you feel led to donate.